A retired Professor of Marketing and Advertising. Prof. Katz contributed this article to the website of Beit Hatfutsot. Mention to friends that you would like to visit the Hawaiian Islands and they will probably have the typical image in their minds: tropical breezes, palm trees, girls in grass skirts dancing the Hula, white beaches and young men and women on surfboards in thirty foot (nine meter) waves. Tourism, one of the major industries in the Hawaiian Islands, thrives on such images. What most people will miss, especially the many Jews from the mainland of the USA who travel there for vacations or conventions, (almost 2400 miles, 3800 kilometers from the west coast,) is that on three of Hawaii’s more densely populated islands, Oahu, Maui and Hawaii (also called “the Big Island”) are viable Jewish communities. On the islands of Maui and Hawaii, the communities are 25 to 30 years old. One of the earliest attempts at forming a Jewish community in Honolulu occurred in 1901. A group of about 40 residents established the first congregation, The Hebrew Congregation of Hawaii. It was, however, relatively short-lived and disbanded after six years. The Jewish Welfare Board, after World War I, helped to establish a JWB center in a private home. This flourished and led to the founding in 1938 by about 35 families of the Honolulu Jewish Community. They soon established a Jewish Community Center that later served as Honolulu’s first permanent synagogue. The group later formed Temple Emanu-el. Of the estimated 10,000 plus Jews who are permanent residents of Hawaii, a little over half live on Oahu and in the Honolulu area while the remainder is spread among the other islands. Maui has the second largest Jewish community and most of the others live on Hawaii. There are no records of when the first Jews came to Maui (pronounced mOWee). It is realistic to assume that some arrived as traders in the 19th century, about the same time as did others who came to Honolulu. Maui’s sugar cane, pineapple, general agriculture, fishing and livestock industries were growing. This was an attraction to merchants, sellers and some professionals following World War I as well. Maui was also a major military base during World War II. There were Jewish service men and women that attended services with military chaplains. Some chose to remain or to return to Maui after the war. Maui’s development as a tourist attraction also began to rapidly mature starting in the 1950s. The employment and business opportunities, climate and low cost of land were strong attractions for individuals and families, many of whom migrated from west coast cities in the USA. 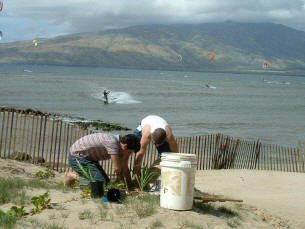 In the 1960s and early 1970s a number of Jewish families, mostly retirees, settled around the old Lahaina-Kaanapali area on the northwest coast of Maui. The area, originally one of the centers of the sugar cane refineries, was beginning to grow from the new tourist industry. A number of these families would get together in individual homes to celebrate some holidays, and an occasional Shabbat, with festive meals. These get-togethers evolved into group Passover Seders and casual holiday services in beach parks and, occasionally, in hotel function rooms. The expansion of tourism and Hawaii as a center for conventions, especially on the island of Maui, brought many people from the USA mainland to the islands. High-tech companies also began to establish there. The various attractions of the islands attracted numerous young Jewish singles and families as well. Many chose to settle in the new paradise. They in turn attracted other young Jews and the growth was under way. By the late 1970s a large number of young Jewish families with children established homes in other areas of Maui. 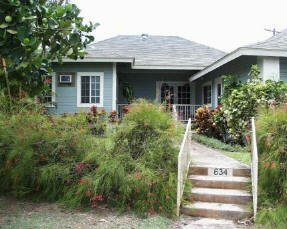 Most situated in the growing town of Kihei along the southwestern coast and old towns on the slopes of the large inactive volcano, Haleakala, an area which is called, “upcountry.” Many, who had conservative and traditional Judaism backgrounds, would get together and host holiday events in their homes. The influx of young Jewish families and singles had an energizing effect on the entire Jewish community. These young people wanted to maintain their Judaism and through word-of-mouth the various gatherings grew. By the early 1980s the group had an informal set of directors led by Tikva Ben Dayan and her Israeli husband “Jo-Jo.” In the spring of 1983 Tikva’s and Jo-Jo’s son had his Bar Mitzvah. An Israeli who came from Honolulu with a Torah led services. The modern Jewish population, which has made Hawaii, and Maui in particular, home for themselves and their families, are mostly professionals, business developers, scientists, specialty storeowners, high-tech specialist and managers. They have been drawn, to a large degree, by the climate, professional opportunities, business prospects, and relaxed life style. Others were initially attracted by the opportunity to participate in their favorite water sports, various forms of surfing and sailing. They too remained after finding positions and opportunities in the growing economy. Maui, the second largest island in size and population, and a relatively short distance from Oahu and the other islands, had a few Jewish singles and families scattered throughout the five or six towns and small cities where the majority of people lived. They too were principally professionals and business people. Doctors, dentists and psychologists began the challenging job of establishing practices. Many business people turned to retailing and services to supply the growing tourist industry. Others found their way into real estate, various services and other businesses to serve the ever-growing population. The people of Maui, like other islands in the Hawaiian group, are multi-cultured and multi-racial. Japanese and Chinese descendents of workers brought to the islands as farm workers in the 18th and 19th century, are a large proportion. There was intermarriage between the children of these workers and descendents of the native Hawaiians and Polynesians and later with Europeans. Other large groups are from Polynesia, Micronesia, as well as from Australia, New Zealand, the USA and other countries. The result is a multi-racial, multi-cultured society with little, if any, racism, bigotry or anti-Semitism. Several of the young Jewish families who found their way to Maui twenty to thirty years ago, settled in the scattered residential areas. Some realized they were missing that which had been an important part of their lives: namely a communal Jewish identity. The dispersion of areas where people lived presented difficulties in finding a central point where Jews could meet for holidays, celebrations, Shabbat services and cultural activities. Some families began meeting occasionally in homes in various areas to help solve the problems, though many individuals and families had to travel long distances. By the early 1980s the new Jewish community had become more widely known. Homes were no longer suitable for the numbers that attended and they expanded to field houses in the local parks. They decided a name was important and adopted, The Jewish Congregation of Maui. They were soon meeting at least once a month for Friday evenings and Shabbat services. In the late 1970s, Jonathan Waxman, a young professional with a strong Conservative Jewish background, made Maui his home He was very active in the leadership of the growing congregation, which incorporated as The Jewish Community of Maui. Jonathan was named as president and helped in leading services. He felt more could be done to bring together the Jews who had settled on Maui. As the new congregation grew its distinctive character and broad spectrum of Judaic experience began to emerge. Most people had come from the USA. Others had come from South America, Mexico, South Africa, Australia, New Zealand and Israel. They brought with them Jewish upbringing and experience ranging from orthodox to reform. Secular Jews, with little or no Jewish background, sought out the new group and the distinctive support it offered to living in a multi-cultured community. 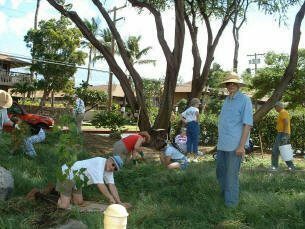 Senior citizens, who had retired on Maui, helped in enriching the broad Jewish character of the group. The leadership expanded as more people joined. Joel Richman took over the presidency from Jonathan in 1989. Those essentials that would add a stronger feeling of establishment were of foremost consideration. Two priorities were brought forward; a building of their own, which would be both a synagogue and cultural center, and a Jewish cemetery. The cemetery was much easier to fund and establish and was soon utilized. One of the older retirees, who had devoted much of her time and energy to the congregation, was the first to be buried in the new cemetery. In 1995 the group was then struck with a great tragedy when Jonathan Waxman, who had remained a director of the congregation, was killed in a car accident. He was buried in the congregation’s cemetery, on Maui in “Jewish soil,” as was his wish. Following his death, Joel Richman took over the full lay leadership. In addition to being president of the congregation he conducted all Shabbat and High Holiday services. Recognizing the distinctive range of Judaism that existed within the group, they created an environment to bring all the Judaic denominations together. Howard Cooper, a noted Jewish educator and author, was brought in to lead High Holiday services. During the next four years his progressive influence was a major factor in shaping the groups ideology. The objective was to develop a community where each person could maintain the religious/Judaic feeling with which they felt most comfortable. Religious conflict and intolerance did not exist. The Orthodox accepted that men and women could sit and pray together. Those with Reform and secular backgrounds acknowledged the prayers and Halachic feelings of the Orthodox. Even the special ceremony of the Birchat Hacohanim – the priestly blessing, which is not in Reform services, became part of the ritual on the high holidays. Of particular relevance is that many members, men and women who had the education and instruction, were able to chant from the Torah and the Haftorot. Bar and Bat Mitzvoth began to take place with instructions by members with well-rounded Jewish experience. In spite of their backgrounds, those nurtured in Orthodoxy accepted women being called for an Aliya to Torah, to read or chant from the Torah and to wear a kippah (skullcap) and talit (traditional prayer shawl). The congregation continued to flourish as other Jews came to Maui and sought out the exceptional group. The community continued to grow and new Jewish families and singles sought out the group. Visitors to the island looked for the congregation and came to functions and services. Numerous prominent Jewish public figures, many from the entertainment world, who lived on Maui, had vacation homes, or were visitors, were drawn to the group. Among them was Linda Lingle, who was Mayor of Maui at the time and later went on to become the governor of Hawaii. An organization came about with elected leaders. A board and committees were chosen to help set direction and develop congregational and community functions. They established themselves as The Jewish Congregation of Maui and in 1991 incorporated as a non-profit organization. Members with strong backgrounds in Judaism, Judaic studies, Hebrew speakers, Zionists and others came forward to help in starting classes in adult studies and to plan programs for young children and the growing numbers of teens. Cultural programs were created for the entire community. Jewish entertainers, scholars and lecturers who were brought over from the mainland by the JWB in Honolulu, were invited to come to Maui to perform, lecture and teach. It soon became evident that the congregation and Jewish community needed a permanent home, rather than to continue meeting in public facilities. Initial funding was started and in 1997 the group rented a building, from a small Christian group that no longer met. The building was ideal to serve as both a cultural center and synagogue. One large room could seat a little over 100 people. A small stage was redone as a bima. The “traveling” Holy Ark was assembled to be a permanent home for the Torah. The group adopted the name Beit Shalom for their new home and a new phase began in the life of the Maui Jewish community. At the end of 1998 the building was purchased. The final payment was made in 2001. In 1990, David Glickman who would later become the rabbi of the congregation at Beit Shalom came to Maui as a member of a team doing research on humpback whales. David was born in Los Angeles. He was brought up in a modern orthodox context, strongly influenced in observance by his father who is a cantor. He attended orthodox schools for his primary and high school education. When he was 16 he went to Israel on Aliya. He settled in Jerusalem where his father had been born and the majority of his family still lives. He continued his religious high school education and upon graduation entered the Israeli army serving in the famed Golani brigade from 1980-1983. Soon after coming to Maui, he became involved in the congregation. Teaching in the bi-monthly Hebrew school filled an important need for the congregation as well as for David. With his background in ritual, Torah and Hebrew, he soon became a lay leader in conducting services and helping to provide for life cycle events and the monthly and seasonal services. At the same time he continued his studies at the University of Hawaii and achieved his BA in Psychology. In 1998 he went to the East coast of the USA to assist his father in High Holy Day services. There, at the urging of two rabbis, he returned to intensive private Judaic and Talmudic studies and received his Smichut l’Rabbinut (Rabbinical ordination) as an orthodox rabbi. The congregation on Maui immediately invited Rabbi Glickman to return to them as their full time rabbi, a position that he readily accepted. He married Jody-Lynn, a native of Maui. They established an observant home for their growing family. The Jewish Congregation of Maui (JCM) is unaffiliated in order to appeal and be inviting [and serve] to all Jews regardless of their personal beliefs and situations. Our post-denominational approach is rooted in strong Jewish tradition, acknowledgement and adherence to Halacha and open minded and creative application of these laws and tenets. This distinctive philosophy enables the congregation to continue growing with Rabbi Glickman as its spiritual leader. His wife Jody-Lynn is virtually his assistant in his undertaking. 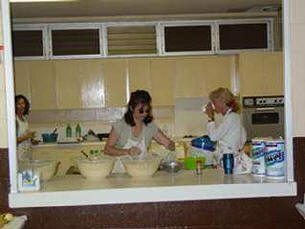 She works part-time in the synagogue office, is the administer of the congregation’s Jewish School of Maui, is helping to create a Jewish pre-school, volunteers many hours on numerous projects and is prepared to help in any way she can. Services are held every Shabbat, both Friday evening and Saturday morning. A core of local residents, men and women with varying Judaic backgrounds attends them. There are often others from the sizeable number of permanent local residents, part-time residents, regular visitors and vacationers. Most of the guests are usually affiliated with Reform and Conservative congregations and generally active in their own synagogues. Services are held on an egalitarian platform mostly using guidelines established by the Conservative movement. Particularly important is that on the second and fourth Fridays of each month the services are co-led by Rabbi Glickman and Cantorial Soloist Rose Roselinsky Crowe. Cantor Crowe was the lay leader of the Reform congregation, Gan Eden, before they disbanded. Her participation with JCM appeals to the former members of Gan Eden who liked her style of services. These include a slightly shortened Kabbalat Shabbat and a full Maariv. Many of the prayers are chanted in Cantorial style and others read in English. Rabbi David Glickman leads services on the other Fridays that are more traditional and comprehensive. The amount of Hebrew used depends on the level of knowledge of those attending. The triennial Torah portion is read based on the division established by the Conservative movement. High Holiday services are well attended with upwards of 130 to 150 worshipers. For the final blowing of the shofar, it is standing room only by families with young children who must travel longer distances to have the children experience some part of the holy days. This is followed by a community, “break the fast,” provided by the congregation and brought in by a kosher caterer. The location of Beit Shalom gives those who participate in the Tashlich ceremony the distinctive opportunity to walk a short distance to the ocean shore to empty their pockets of crumbs and read from the Book of Micah. Life cycle events have become an important part of congregation life and attraction to the Jewish community. All Jewish families can celebrate their child’s birth with a baby naming ceremony. A local Jewish pediatrician can perform a brit milah (circumcision), should the family not wish to bring in a traditional mohel from the mainland. B’nei Mitzvah have the luxury of creating a personal learning experience to observe this special time in their lives. Ceremonies have varied from beach and hotel ceremonies to traditional services. B’nei Mitzvah come from the mainland to celebrate the occasion on Maui with the rabbi’s participation. A number of the Jewish singles have found their life partner in the congregation, were married and built their homes on Maui. Jewish couples do come from other states to be married there. Rabbi David Glickman adheres to Orthodox observance regarding marriages. When a death occurs the Jewish cemetery is available and volunteers come together to form a hevra kadisha. The Jewish School of Maui is among the many important achievements of the congregation. Children between the ages of 4 to 16 attend every Sunday for two hours. They learn under the guidance of skilled teachers among the congregation who have extensive Judaic backgrounds. The goal is to make Judaism meaningful through a curriculum that covers basic Hebrew, symbols, holidays, customs, life cycle events, mitzvoth, Torah, history and Israel. B’nei Mitzvah students meet with the Rabbi for additional individual study. The Jewish holidays and festivals are excellent opportunities for participation by families and their children. Pesach is one of the busiest of the year with a community Seder that is attended by up to 350 people, including children. Lag B’Omer is celebrated at a beach park with enjoyable events for adults and children. Tu B’shvat is celebrated with the planting of trees and picnicking. Purim features a carnival with fundraising for the school through local craft vendors, plant and produce sales and many festivities for the children in costumes. Simchat Torah is an exciting day of celebration with hakafot (holding the Torahs aloft and passing them around), Israeli dancing and more. ***** On Shavuot the congregants gather for a dairy food dinner and many stay to study Torah into the early hours of the morning. 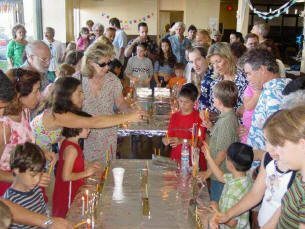 A Chanukah party is held every year, in which well over one hundred families and children participate. There is a group lighting of candles with all chanting the brachot (blessings). A group of volunteers prepare and serve hundreds of traditional potato pancakes. Chanukah songs are sung; dreidle games played and all have a wonderful time. A special feature of this holiday is the lighting of the candles in one of the big shopping malls. In addition to more Jews coming many non-Jews gather around to see the chanukiot, candle lighting, and enjoy jelly donuts. They learn the meaning of the holiday and join in singing Chanukah songs. Understanding other religions on Maui is one of the important elements as to why there is such religious tolerance among the many cultures and for Jews, no ascertainable anti-Semitism. In a short time a loosely knit group of Jews have worked together to build a relevant Jewish society. They have created an atmosphere that has a dynamic and imaginative approach to bringing together Jews of different backgrounds and religious attitudes. There are activities with strong Judaic content, a Jewish school and a synagogue with a full time rabbi. The community can participate in observance of all Jewish holy days, festivals and days that commemorate important events in Jewish history. The Jews of Maui have established something that is quite rare today, a new and growing Jewish community in an area somewhat isolated from mainstream society. Beit Hatfutsot wishes to express its gratitude to all members of the congregation, too numerous to mention, who were instrumental in collecting information for this article. Special thanks to Rabbi David Glickman, Mr. Joel Richman, and Mr. Larry Feinberg, for their help and input on the history and development of the Jewish Congregation of Maui and Beth Shalom. * The ships log of the whaling ship Neptune, which come to Hawaii in 1798, had a recording “…that the Hawaiian king” had come aboard and brought a Jewish cook with him. There is no mention of from where and when the cook arrived. Nor did it reveal his relationship to the king, or what he did afterwards. ** An interesting anecdotal story of this was researched and reported by Dr. Jacob Adler, Professor Emeritus, of the University of Hawaii and Rabbi Julius Nodel, Rabbi Emeritus, of Temple Emanu-el in Honolulu. A Jewish trader, named Elias Rosenberg from San Francisco, came to Honolulu with his family in 1886. He brought with him a Torah Scroll and Pointer. He developed a friendship with the Hawaiian King Kalakaua. Rosenberg had to go back to San Francisco in 1887 and he entrusted the Torah and Pointer with King Kalakaua for care. Rosenberg never returned and the two items, in turn, were passed on to the King Kalakaua’s descendents. Members of the small Jewish community that existed lived around Honolulu frequently, up through the 1920’s or 1930’s, borrowed the Torah and Pointer for services from the Kawananakoa family that had become the caretakers. The family gave the pointer to Temple Emanu-el in 1959. The Torah, however, had disappeared but turned up again in 1972. The Kalakaua Torah, as it is called, is now on display at Temple Emanu-el. *** The old culture and language of Hawaiians is easily picked up and integrated into daily living among those who settle there. Among the Jews on Maui, and probably the others islands as well, they have put together the Hawaiian word “aloha’ and the Hebrew word “shalom,” both of which have essentially the same meaning and usage in all respects. The result is the word “Shaloha,” which is used in greetings. **** Families that wish to maintain kosher homes come together periodically to place a group order for kosher meat with a kosher meat packer in the Los Angeles area. The meat is frozen and shipped to Maui. ***** The Jewish Congregation of Maui now has three Torahs. The first donated by the Feurman family and two that are Czech Torahs on permanent loan from the Czech Torah Network. One is on loan to JCM and the other to Gan Eden. Theirs is with JCM for safekeeping. These are two of the over 1500 Torahs that were confiscated by the Germans during World War II. They were later found in an old synagogue and taken over by the State Jewish Museum of Prague. For more information on the Czech Torahs see The Czech Torah Network. Entrance to Beth Shalom synagogue. 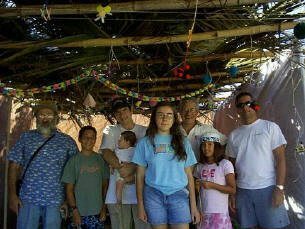 Completed Sukkah with building crew, 2001. Tu B’Shvat planting along the ocean shore. Tu B’Shvat group planting of trees. Preparing traditional pancakes (Latkes) for Channukah party. 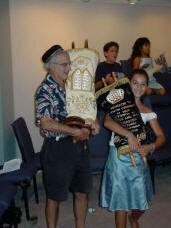 Larry Feinberg and daughter holding Torahs.